Taeyeon from Girls' Generation was treated poorly at the airport Jakarta. In a video you can several people rushing towards her, pushing her to the ground and causing her to cry. 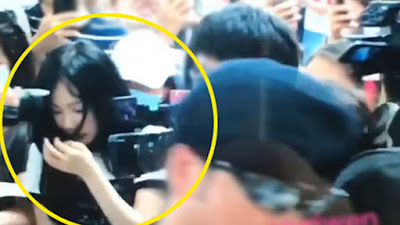 Several sasaeng fans were seen rushing towards the singer, even managing to grab and push her. Security guards are seen trying to keep the fans at bay, pushing them back. Taeyeon went to Jakarta for the Asian Games 2018 together with Hyoyeon. In the middle of the chaos, a security guard is seen picking up Taeyeon, further causing her to feel scared. In response to the guard picking her up, she said, "The local security guard thought it was a dangerous situation so he lifted me up, which was also very baffling and surprising." “At the Jakarta airport, there were so many people in a crowd as feet and bodies kept getting tangled up with each other. It was a dangerous situation where I fell on the floor shaking, and I couldn’t stop crying. The local security guard must’ve thought it was a dangerous situation, because he lifted me up from the back. But that in itself was also very baffling and surprising. I was already tense from the body contacts from both my sides and my back. I was disheartened that there was no order at the airport, and even the people who were waiting for me also fell down. Some of them may have even gotten hurt, so my heart does not feel good right now. That feeling made me embarrassed and I couldn’t get a hold of my senses. Because of that, I couldn’t arrive at Jakarta, where I have not been for a while, with a good image. I am so sorry to the fans who were waiting. Please keep order so nobody gets hurt. Our fans have more love, affection, and understanding for each other, more than anyone else, so I will consider today as a one-time event. I hope that no one gets hurt.